Target has yet another collaboration in stores right now! This collab is not only bold, colorful, and graphic but it is super chic. The collaboration is with Peter Pilotto and it incorporates a lot of colors and patterns into the garments. You may be thinking that you can't pull off these looks. But, in reality they are super fun and are great for spring or even supper. I can picture someone wearing these pieces with things that they already own to tone them down. 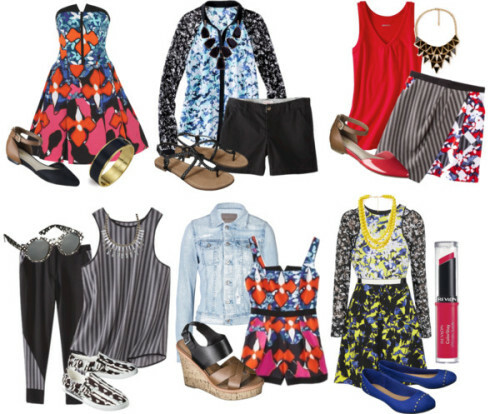 Here are 6 outfit ideas incorporating the Peter Pilotto collection at Target. Almost everything you see you can purchase at Target! It's a one stop shop. But other pieces are from Forever 21 and other affordable stores. My favorite look is the dress in the lower right corner! It is super bold and has a great print. So be sure to check out your Target for the collaboration!